Classes are offered in the following styles of dance and performance. Check the Schedule for specific levels available. Ballet Classes are for all ages, 3 years and up, and range from recreational and introductory, to more structured classes with syllabi and repertoire. The style of ballet in these classes is disciplined, encourages graceful movement, good use of balance, poise and posture, and is an excellent training for most of the other forms of dance. Pointe is also available for those who have trained previously, and are deemed ready by their ballet mistress. Ballet provides a constructive and exciting challenge for developing children to adults, and everyone in between. Modern Theatre Dance defies a single permanent definition. This is largely due to its ability to adapt, develop and evolve with the changing fashion in dance. Through a carefully planned and well-tried examination syllabus, which combines modern dance, jazz and other dance styles, young people are trained to become disciplined and versatile dancers who have a professional attitude towards dance. A series of examinations has been created from children’s grades through to professional teaching qualifications. The children’s work is based on natural movements: walking, running, jumping and skipping. It is designed to encourage an imaginative and rapid response from beginners. Boys’ work has been developed to meet increasing demand for a modern dance training for boys. This very popular form of dance is offered for various levels and age groups (mixed classes). Hip Hop is a high energy class involving floor work, choreography and stylized exercises. Students are taught to pick up choreography quickly and to dance it with style! Apart from being an essential skill for the professional dancer, tap dance is one of the most enjoyable and rhythmic forms of recreational dance. The ISTD offers a series of examinations from Children’s grades through to professional teaching qualifications. The Medal Tests are shorter exams designed to encourage good rhythm, style and technique. Classes for all ages. 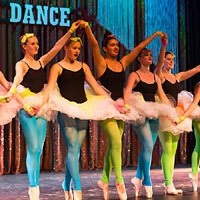 Jazz and Contemporary Jazz are fast paced technical classes. These classes are designed to push students to reach a high level of flexibility, strength, coordination and ease of movement. Students will be challenged with a technical warm-up, various dance steps across the floor and routines varying in style. Come ready to work and have fun! If you like gymnastics and traditional floor exercise elements, you’ll love Acrobatics! Acrobatics involves the development of strength, agility, power, flexibility, endurance, balance and coordination as they pertain to the following acrobatics skills: Rolls, Handstands, Bridges, Partner work, Front walkover, Back walkover, Back handsprings, Aerials, Tumbling… and more! This class is designed for Adults with or without dance experience. Participants will take part in a high energy aerobics class filled with dance moves. This class will keep your body moving, strengthening your muscles and improving your cardio. Stylized routines will keep you exercising without even knowing it! Barre Fitness is a total body workout that is taking over gym and dance studios everywhere! Christina Fitchett will lead this hour class that will help you tone, strengthen and increase flexibility. This class combines a bit of ballet, pilates, yoga and a gentle use of weights and bands. No dance experience is necessary and all levels are welcome!